The new French Revolution Pack has arrived! You may purchase this set within this bundle to reinforce your army and secure this NEW Figure Pack at a great price. This bundle includes 1 x Pirate Crew Pack, 1 x Borgia Guard Pack and 1 x French Revolution! Features: -	One Assassin and four revolutionary fighter micro action figures -	Buildable display environment with real cloth flag and cables -	Comes complete with authentic accessories and weaponry such as pistol, swords and muskets -	Combine with other Assassin’s Creed buildable sets by Mega Bloks to recreate historic battles and adventures. Triggered by the extravagance of the monarchy at the time, the French Revolution brought about sweeping political and social change to France. As the guillotine dropped, assassinations gripped the country in fear. Build your own French Revolution Battalion by Mega Bloks Assassin’s Creed and institute your own brand of justice. Hoist the cloth flag up on real cables in the name of the Republic. Customize your micro action figures with an assortment of weaponry including detailed swords and muskets. As the British and Spanish jostled for dominance of the Caribbean territories, piracy became rampant. A band of notorious pirates dreamt of living in a utopia free from the tyrannical rule of kings and clergy. Conspire with the pirates and build your own Pirate Crew by Mega Bloks Assassins Creed. Take the battle to the buildable cove with fully maneuverable micro action figures including one Assassin and four pirates. To the winner go the spoils – a treasure chest full of gold! 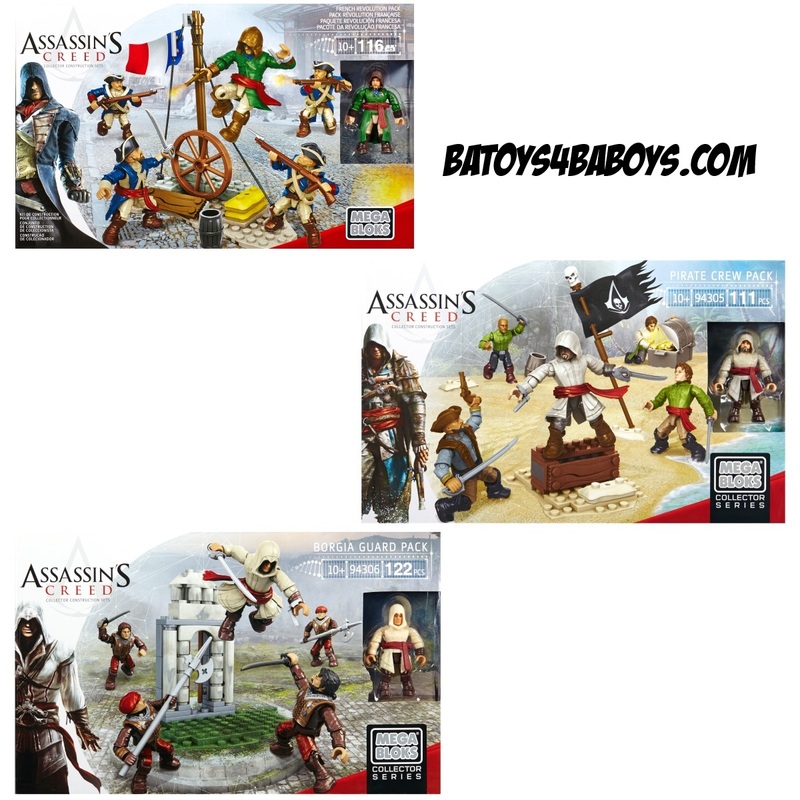 Features: - One Assassin and four pirate micro action figures - Buildable display environment of a pirate cove - Comes complete with authentic accessories and weaponry such as guns and swords - Combine with other Assassin’s Creed buildable sets by Mega Bloks to recreate historic battles and adventures. Grand Master of the Templar Order, Rodrigo Borgia instigated numerous murder plots against European political figures with the help of a ruthless battalion of conspirators. Build your own Borgia Guard by Mega Bloks Assassin’s Creed and establish power and influence across the continent. Take command of a well-armed combat unit of four micro action figures and one Assassin micro action figure. Build the fast travel portal and customize the battalion with an assortment of chilling weaponry.